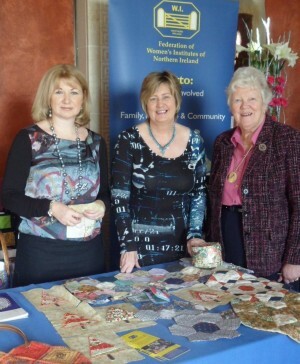 The Federation of Women’s Institutes were invited to take part in the 80th anniversary celebrations of Parliament Buildings on Saturday 17th November 2012. Three members of the Home & Garden Sub-Committee were present – Chairman Nora Lennon, June Beer and Beverley Palmer-Hill. These ladies demonstrated a wonderful variety of floral arrangements that were ultimately on sale and eagerly purchased. Julie Uprichard had a display of traditional crafts that included Mountmellick, white embroidery and lacework. Ann Henning, Debbie Armstrong and Julie demonstrated paper piecing patchwork, appliqué and crochet. There was an ever present crowd around the displays – so hopefully this will have encouraged some new members to join us!